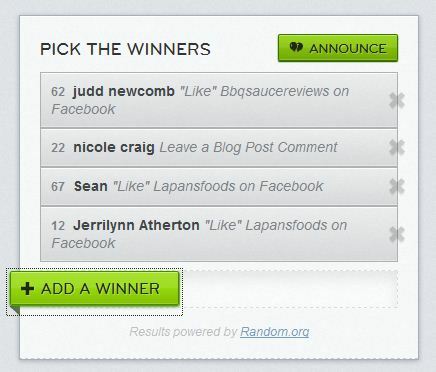 Free Sauce Friday – La Pans Party Starter! I’m very excited to be running a FREE SAUCE FRIDAY today. As many of you know, my wife and I recently had our third child and it’s been a bit busy to say the least… I gotta give a shout out to Jay Prince for staying busy helping me produce great content while my little baby boy has been busy producing dirty diapers! Ah, but I digress. We’re here about the sauce. This weeks giveaway is put on by La Pans who makes a really nice set of products from Bloody Mary Mix (awesome) to BBQ sauces (Foundation and Fiery) to a rub (which I have to try very soon). Every one of their products has been top notch. 1 Grand Prize – This is the Party Starter – BBQ sauce, Bloody Mary mix, and BBQ rub. Would love to cook dinner for the family with La Pan’s party pack. If I won, I’d coat some ribs with the rub and toss them on the WSM. While those slow smoked, I’d make up a batch of Bloody Mary’s to sip and savor. Can always count on you to participate, thanks man. Would love to get some ribs going with this!! If I miss one send out a search party. Now this looks good! I’d like to try some. Part Pack = party? Does it not? Not sure who’s going to drink the Bloody Marys though…. cook some good bbq and have bloody marys…. After the ruff day I had today, Id sure love to try that bloody Mary mix! If i won the party pack, id be excited to try them for Thanksgiving! If I won I would have some damn good BBQ rub on a Turkey and some poor man’s bloody mary’s thank’s to LA PAN’S Party Starter, me and some friends will be HAPPPPPPPPPPYYYYYYYYYYYYYYYYY!!!!!!!!!!!! I would use the party pack for all of my grill meals (which is every day) rain, snow ,or shine. This would be great for a turkey smoke party. Smoke up a bird and put some sauce all over it. Send LaPans to La Mailbox! If I won, I would startwith bloody marys in the morning when I put the rub on the thanksgiving turkey on the smoker for dinner that night. If I won I would make a full rack of rubbed ribs, bbq pulled pork sandwiches, and drink about a 30 pack of beer. In the AM I would surely kill all the bloody mix, hair o’ the dawg style. Thanks again for the shout out Brian! I would definitely use the party pack at a tailgate party. Would like to try it for the big bird day!! I would use the party pack to watch and celebrate the Oakland Raiders climb to victory at the Super Bowl.